For a while now, I’ve been thinking about participating in Camp NaNoWrimo this April, hoping to get a first draft of my third novel done. But, a couple of things have happened recently that have me thinking about doing something a bit different. First, I’ve completed NaNoWrimo twice, getting a first draft out of the deal each time. But there’s a part of me that is a bit worried that without NaNoWrimo, I will struggle to hit my writing goals for a given project. NaNoWrimo is almost like a safety net for me--I know if I sign up, I will complete the 50K challenge. I’m just wired that way. But without that challenge hanging over me head, I’m not sure I can keep myself accountable to hitting consistent word count goals. I’ve also been gaining a lot of inspiration from Joanna Penn’s wonderful blog and podcast, The Creative Penn over the past several months. In a recent video podcast, Joanna talked about creating a production schedule for yourself. Essentially, you decide how many words you want to write over a given time and then break it down into how many words a day you’ll need to write. Now, I have thought about how many books I want to write over the next few years, but I want to start small in terms of my production schedule, until I find a system that works for me, my family, my full-time job, etc. So, I’ve decided to do a test schedule for the month of March. My goal is to write at least 500 words of fiction each day for the entire month. I have a few short story ideas I have been kicking around for a while, and If I hit my goal of 15000+ words for the month, I should be able to at least have solid first drafts of all three stories. Now ultimately, I’d love to write over 1000 words a day, but I’m not sure that’s realistic for me right now. My main goal is to be productive and moving forward with my fiction every day. So the plan is set. March Madness begins in a couple days. You can watch the recent video cast that Joanna Penn did in the player below. Then go check out her blog at www.thecreativepenn.com. I was very saddened this week to hear that one of my all-time favorite gaming sites, 1UP, was shut down by it's parent company, Ziff Davis. As I mentioned in some recent blogs, 1UP was one of the few sites out there that was providing unique discussions on gaming, as opposed to the press-release driven news cycle that a lot of other sites are stuck in. I feared that they wouldn't be able to sustain their approach, and sadly I was right. But rather than dwell on the fact that 1UP has come to end, I want to focus on their legacy. I am not at all exaggerating when I say that this blog, the Secret Identity podcast, and my own time as a gaming journalist would never have happened if it weren't for 1UP. Allow me to explain. I started Secret Identity with my podcast co-host Matt Herring in March of 2006. At that point in time, there were two podcasts that I listened to religiously--1UP Yours and This Week in Tech (TWiT). It was because of these two shows that I had been thinking for some time about starting a podcast of my own, and I eventually convinced Matt, who didn't even know what a podcast was at the time) that we could start our own show focused around comics and other areas of our geeky hobbies. The driving factor for me was that I enjoyed listening to discussion about things I was passionate about. These kinds of discussion reminded me of the way I used to talk about games and comics with my friends at the arcade, the comic shop, the game store, etc. I wanted to create a podcast that felt to our listeners like they were hanging out with us every week at the comic shop. And so, Secret Identity was born. We will be recording our 500th episode next week, and we've been going strong for seven years. In 2008, my love of 1UP had been at a fever pitch for years. In addition to the stellar 1UP Yours podcast, I was listening to CGW/GFW weekly as well, and devouring the 1UP Show videos that are still today considered the standard for visual discussions on gaming. I wanted to try my hand at being a game journalist, as I was exploring different avenues to take with my writing. Through a friend I had made through Secret Identity (Dan Evans), I reached out to Jonah Weiland at Comic Book Resources, arguably the most respected comic news site on the web, and pitched the idea of covering comic-related games to him. He accepted, and what followed was a two-year stint as the coordinator and primary content creator of gaming coverage for CBR. That was a once in a lifetime opportunity, as I was given freedoms at CBR in terms of our approach that I never would have had as a freelancer for a gaming-centirc site. Getting to cover some of today's major franchises like Dead Space and Batman: Arkham Asylum from both gaming and comic perspectives was exactly the kind of coverage I wanted to be a part of. When I left in 2010, it was for no other reason than I simply could no longer keep working for CBR in addition to some of the other commitments in my life. I still hope to return someday. Which brings us to Co-Op Critics. It's no secret (no pun intended) that I would love to do more gaming coverage on Secret Identity, but our audience is largely comic readers, and a good portion of them aren't gamers. So, I decided to start doing "special episodes" of the podcast dedicated to gaming, where those who were interested could enjoy them, but those who just wanted comics could listen to the regular weekly shows. Because the Co-Op Critics podcasts are infrequent though, I was still itching for more games discussion, and so the blog was born. And although it's taken a good year to really get up and running, I am loving where Co-Op Critics is at right now. The discussions are exactly what I hoped they would be--about our experiences with the games we put so much time into. Old games, new games, console games, mobile games--it doesn't matter. Whatever we're playing, if we have something to share about it, we can do that here. This approach is both in response to what I don't like about a lot of current games coverage, as well as inspiration I took from the recent incarnation of 1UP, and their wonderful Cover Stories series. Which is why it's such a bummer that 1UP is closing its doors. I fear for the direction that game journalism and gaming sites are heading right now, and every time we lose a unique voice, it makes me a little more afraid. However, all I have to do is look at the legacy and the years worth of content that 1UP leaves behind to be reminded of what great games discussion looks and sounds like. I hope that in the wake of 1UP's closure, people start going back and revisiting what came out of that site, and that what they learn helps shape what we see moving forward. It may be cliche, but it fits--1UP, you are gone, but not forgotten. Thanks for the memories, the inspiration, and the countless hours of enjoyment you've provided me over the past several years. I received a notice the other day that it was time to renew my web hosting plan for Mo Stache. As I began pricing that out (and realizing how expensive it is), I started to think about whether it made sense to move Mo over to a Weebly site, which is the platform I use for Secret Identity. I originally launched Mo on a free Weebly site a few years ago, but it became quickly apparent that the platform was not set up well for webcomics. The biggest issue at the time was that there was a size restriction on images, which meant I could only display comic pages a thumbnails, which you’d have to click on to see in a larger format. That kind of disrupted the flow of reading the comic, and I eventually decided to buy a hosting plan and move over to WordPress. To this day, most webcomics use WordPress (and a plugin called ComicPress) as their platform of choice. It provides a decent experience for the reader, but in my experience it’s been a nightmare to work with. Setting up the initial site was a weekend-long endeavor that involves phone calls, lots of cursing, and tons of trial and error. I also had to start from scratch about a year ago when a software update crashed the site, and I couldn’t figure out why. In a nutshell, I hate WordPress and the only reason I’ve used it to this point was because I didn’t want to have to start over again, especially now that we’re approaching 100 pages of our comic. But, I use Weebly daily for the Secret Identity site, and I love it. 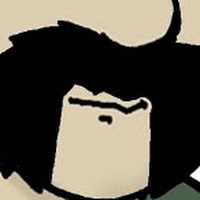 While the basic tools are still not the best fit for webcomics, the image size issue has long since been addressed, and I think that I could build a decent site for Mo on the platform now. Best of all, I could do this with the free tools that Weebly has without needed to purchase an additional hosting plan. So, I’m going to start building a site on Weebly while still hosting the comic on WordPress for now. If I can make it work, the switch will be on. If not, I may be stuck with WordPress for the duration. If you’ve read my novel Courting the King in Yellow, or if you’ve ever listened to the Secret Identity podcast, then you know I am a huge horror fan. Specifically, I am a huge 80’s horror fan, of the B-movie variety. Don’t get me wrong, I appreciate quality horror, but I have a special fondness for low-budget horror that has shaped my love of the genre since I was a teenager. During my middle school and high school years (late 80’s into early 90’s), my best friend and I spent the majority of our free time watching horror films. Our school vacations were filled with movie marathons, and I can confidently say that through about 1995, I had seen almost every horror movie that was released in the US on VHS. One of the most memorable horror movies I’ve ever seen is the 1983 slasher film Sleepaway Camp. 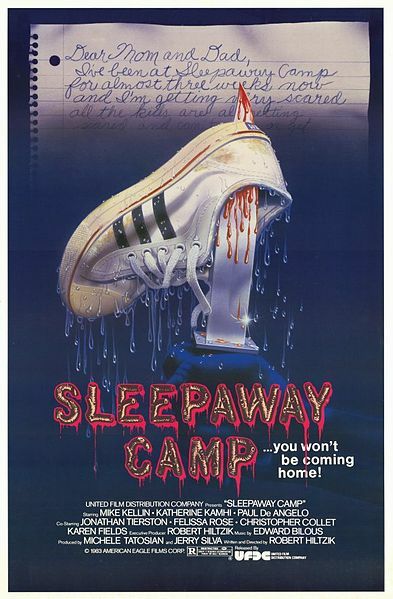 At the time of its release, the Friday the 13th series was in full swing, and Sleepaway Camp was clearly inspired by that franchise. The film revolves around a series of murders that are occurring at a kids’ summer camp, and like the original Friday the 13th, the killer is not revealed until the end of the movie. Despite featuring poor writing and acting, as well as pretty bad special effects, Sleepaway Camp was vaulted into the horror hall of fame by one thing--its ending. The final moments of the film were shocking, and anyone who has ever seen the movie will never forget the final scenes. I remember my best friend and I literally jumping up off the couch and running out of the house screaming and laughing, as we could not believe what we’d just seen. The reason I’m writing about Sleepaway Camp now, is that in a recent episode of Secret Identity we made a passing reference to it, and one of our listeners watched it for the first time afterward. His reaction was priceless, and he mentioned that the podcast How Did This Get Made? had done a recent episode about the movie. I in turn listened to that episode, and was in tears listening to Paul Scheer an company try to make sense out of it. So, if you are a fan of horror, and you have not seen Sleepaway Camp, you can now watch the entire movie on YouTube--in fact, you can watch it in the player below. Do yourself a favor and don’t just skip to the end, as the final moments are so much better when you’ve watched the build up. After you watch Sleepaway Camp, go and check out the How Did This Get Made? episode about the film. Your enjoyment of it will quadruple. The discussion they have about the movie is exactly the type of discussion I have with my pals about horror flicks, and it’s one of the reasons I love the genre so much. Enjoy! Last night, I posted on Twitter that I had finally started watching the new Fox show The Following, and I was really digging it. That post sparked a discussion with one of my friends about how he wasn't enjoying the show as much as I was, partially because he didn't find the main premise believable. For those who haven't checked it out, The Following is about a serial killer who has inspired a cult following that he influences from behind bars. The agent who originally caught him is called in to try and thwart the killer's plan to have all of his followers begin committing murders, using him as their inspiration. 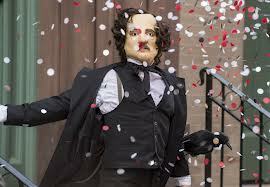 The killer himself is inspired by Edgar Allan Poe. In the Friday the 13th series, Jason Voorhees can walk faster than all of his victims can run, and he is a near-indestructible force. In Hellraiser, a Rubik's Cube-like device can open a portal to Hell. In Evil Dead, reading from a ancient book can raise demon spirits that will possess the living. In Weaveworld, an entire world exists within a magical rug. In The Lord of the Rings, a piece of jewelry can bring about the end of the world. When a new story in introduced to a reader/watcher, there is a certain amount of world-building that needs to take place. I tend to give a creator a lot of room to build that world--whether it be the first several chapters of a book, issues of a comic series, episodes of television show, or the first entry in a new film franchise. Once the creator has established their world, then I have some expectation they will adhere to the rules they have set up for that world. That, to me, is where the believability of a particular story comes in. When the story is new however, I want the creator to go as far out there as possible with his or her ideas. There'e been a lot of buzz over the past couple weeks over the debut of Vine, a video service launched by Twitter on iOS devices. The Vine app lets you take six-second videos and easily share them on Twitter. Being an Android phone user, I wondered if there was a similar service for non-iOS Twitter users so I did a little searching and found Tout. Tout has actually been around for awhile (it launched in 2010), but has garnered some more attention since the launch of Vine, as it's basically a competitor to that service. The main difference between Vine and Tout that I've seen so far, is that you can create up to fifteen-second videos with Tout, which I like better than the six-second limitation of Vine. We got walloped over Friday and Saturday with over eighteen inches of snow, and I used Tout to take a few videos of the before, during and after phases of the storm here in Western Mass. Take a look! Have You Checked Out MO STACHE Yet? I write quite a bit about my book here on the blog, but there's another writing project I've been working on continuously since 2010--Mo Stache. Mo Stache is a webcomic about a regular guy names Dave who wakes up one morning to find an alien mustache named Mo is living on his face. As you might imagine, Dave's life gets very complicated, very quickly. 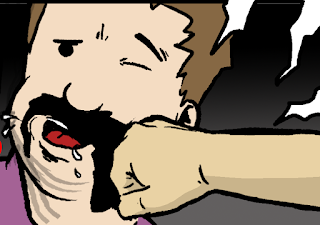 Artist John Cordis and I have been putting out Mo Stache page by page for two and a half years now, and we just posted our ninety-second page this week. We're in the final chapter now, and the entire story should end up being around 120-130 pages. You can check out the trailer for Mo Stache in the player below, and then you can read the entire series so far for FREE over at www.mostachecomic.com. I mentioned in a recent blog post that my good friend Alana Abbott was gearing up for a Kickstarter project, and I’m happy to say she launched it this past week. The project is to fund the release of Regaining Home, the third book in her Redemption trilogy, which began in 2006. 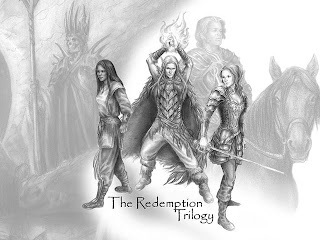 At that time, Alana was writing the trilogy for White Silver Publishing, as it tied into the setting of their fantasy RPG Chronicles of Ramlar, which Alana wrote most of lore for. The first two books, Into the Reach and Departure, made it to print, but White Silver ran into some financial issues, and the third book Regaining Home never saw the light of day. Alana now has the rights to the series back, and she has brought her original editor (Shawn Merwin) and artist (Lindsay Archer) back on board to properly finish this trilogy. The rewards for the Kickstarter project range from getting an eBook copy of Regaining Home to naming a character, to having some input into the story itself! If you pledge at least $9, you’ll get eBook copies of the first two books, and Regaining Home as well. Once you’ve read the first book Into the Reach, download the writer’s commentary style interview I did with Alana about it over on Drive Thru Coimics for free! Click here to head over to the Kickstarter page and check out all the details!